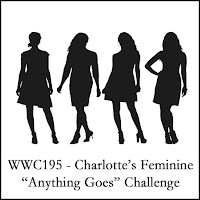 Water Cooler Wednesday #195 with the theme "Feminine Anything Goes"
Retro Rubber Blog Challenge #99 with the theme "Anything Goes" using a stamp that is at least one year old (I chose one that is three years old). 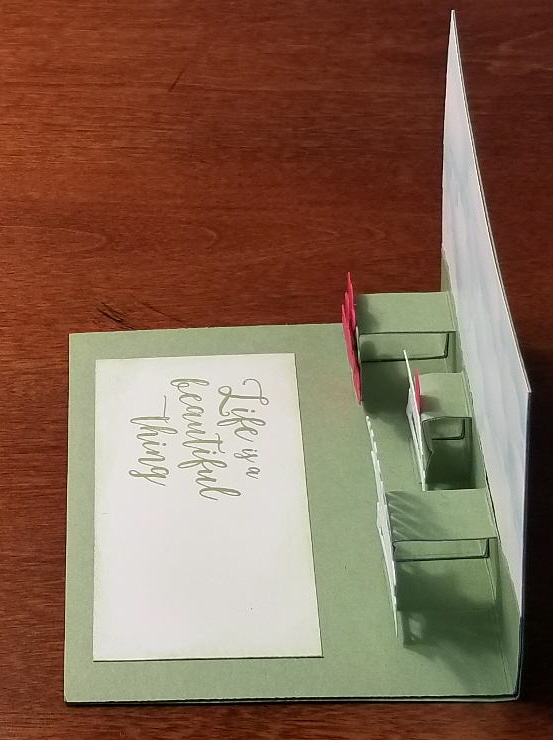 Since both challenges wanted to see what we could do with our imaginations, I chose to once again tackle a card technique that I'd never done before - a pop-up card. I had bought Stampendous "Pop Up Stages Dies" several months ago, but hadn't used them, I figured now was the time!!! With the general theme of "feminine", my mind right away turned to my Adirondack chair die in Stampin' Up! 's (SU) "Seasonal Layers" Thinlits die set. I had seen a clever way to cut the chair to create a matching table, so a sweet pink drink and nearby flowering shrubs bubbled forth in my imagination. I started with an 4.25" x 5.5" SU Whisper White panel that I sponged several clouds to the top inside panel using SU Soft Sky ink. I used a scrap scallop circle to sponge SU Soft Sky around the edges to create the clouds. Using a scrap piece of SU Wild Wasabi, I tore the long edge in an irregular fashion for the background greenery. I glued this to the bottom of that sky panel since I wanted my pop-up mechanisms to blend in with the background (i.e. be the same color). I then glued this grassy sky panel to the inside top of a standard A2 sized card base cut from SU Wild Wasabi cardstock. The Adirondack chair and matching table were cut from SU Whisper White Thick cardstock to make them sturdy. I used SU Snail Adhesive to run a strip of adhesive vertically down the middle of both elements. You don't want the adhesive to extend beyond the width of the stand-up part of the pop-up column so the card doesn't get stuck together when you close it. 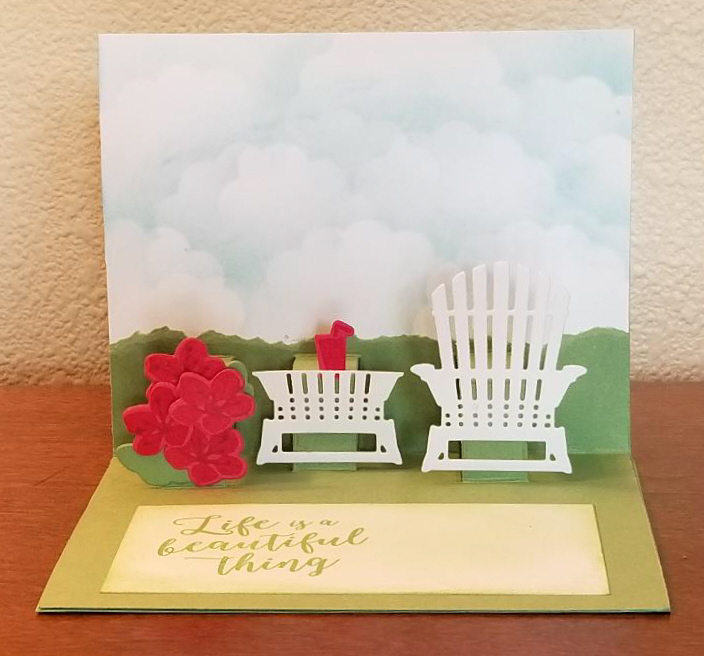 The flowering shrub was made by stamping blossoms from the SU "Colorful Seasons" stamp set using SU Melon Mambo ink on SU Melon Mambo cardstock. I used my MISTI to position the flower stamens onto each blossom. Then cut each blossom out using it's matching die from the SU "Seasonal Layers" Thinlits dies. In addition, I used one of the blossom dies to cut out two "leaf clusters" from SU Wild Wasabi cardstock. These leaves and blossoms were glued to the upright part of the pop-up mechanism using Tombow glue. The front-most blossom was attached with tiny piece of adhesive foam to give the bush depth. A glass of pink lemonade was stamped similarly to the blossoms, and die cut with its matching die. It was tucked behind the white table where there was snail adhesive to hold it in place. AI sponged SU Wild Wasabi ink along the edges of a scrap piece of SU Whisper White cardstock, then lightly sponged the entire white panel surface to lessen the stark contrast with the rest of the card. I used my MISTI to stamp the "Life is a Beautiful Thing" sentiment using SU Wild Wasabi ink. This sentiment is from the same SU "Colorful Seasons" stamp set. To hide the holes created by the pop-up dies, I cut a standard A2 card base from SU Wild Wasabi cardstock. I used the super strong red double-sided tape generously on the back of my pop-up panel (top and bottom) - especially near the edges, and along the bottom and top of the folding mechanisms. I then CAREFULLY attached the folding inside piece to the Wild Wasabi card base, one part of the panel at a time. 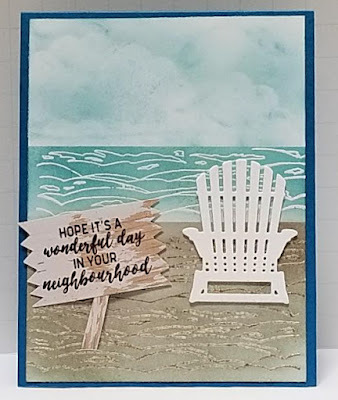 The front of the card was created by stamping the sentiment using the 2015 retired hostess "Happy Birthday, Everyone" set with SU Wild Wasabi ink onto a 5.25"x 4" piece of SU Whisper White Thick cardstock. I used my MISTI to stamp the sentiment several times to ensure a nice dark inking. 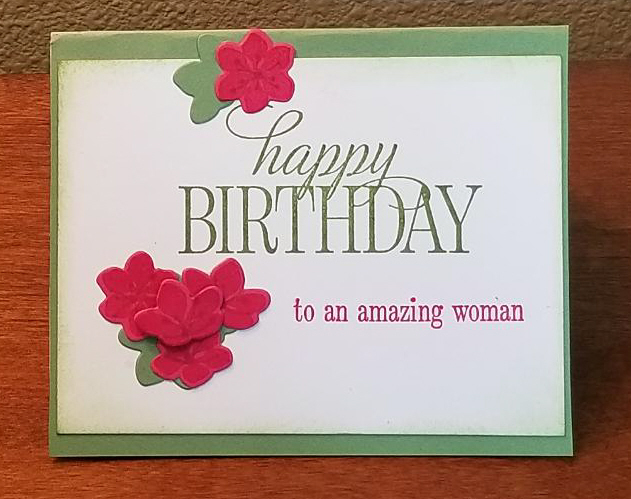 The "amazing woman" part of the sentiment is from the same stamp set, but stamped with SU Melon Mambo ink. These inks were chosen to match the colors on the inside of the card. 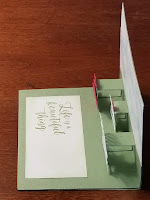 The flowers and leaves were created the same way as was done for the flowering shrub inside the card They were attached using Tombow glue, and one small piece of adhesive foam. 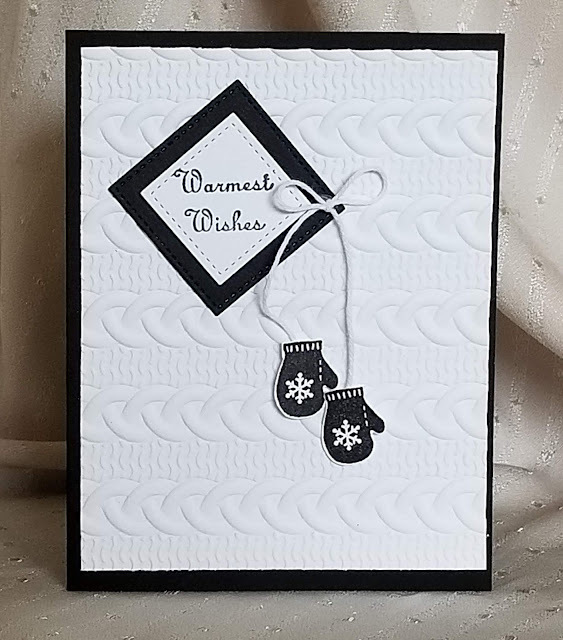 The edges of the white panel were sponged with SU Wild Wasabi ink to soften the contrast between the panel and the card front. The finished panel was centered and glued to the card front. Note that this card is VERY thick and will need extra postage to mail it. It DOES fit inside a standard A2 envelope, however. This card took me about 2.5 hours to make. I'm sure it would be quicker the second time around. Because of this, and the care it takes to create and assemble all the pieces, I am rating this card at a difficulty level of "4" out of a possible "5". I'm planning to send it to my MIL for her birthday next year. I know she will really like it! What a great pop-up card, Donna! I love it! How clever to have chopped off the top of the Adirondack chair to make that outdoor table. I'll have to borrow the idea. The front and inside of this card are simply beautifully designed. Thanks so much for joining our Watercooler Wednesday Challenge this week. Oh my word ... I'm speechless - and that rarely happens! Your imagination has gone into overdrive. I have all the SU gear that you've used and I've never once thought of using it for a pop-up card. Totally amazing and totally amazing patience and skill. What a fabulous way to use your retro gear. Thank you for sharing it, along with all the how-to details, at Retro Rubber Challenge. Very nicely done pop-up card. 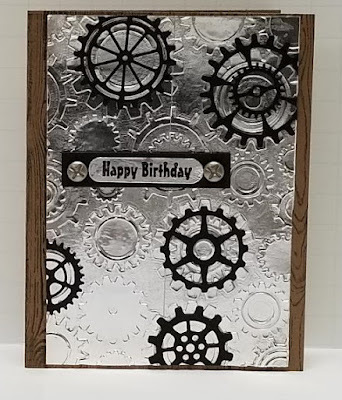 I like the Stampendous stage pop up dies as well, and you did a wonderful job using them with dies in your stash. Great feminine card too, what a lucky recipient! Thank you for playing along with us at Retro Rubber! This is AMAZING! How fun and clever! Anyone would be thrilled to receive this little goodie! Thanks for sharing this with us at Retro Rubber this week! What a wonderful pop up card! Thanks for joining us at Watercooler Wednesday Challenges! Love your pop up card and love your clouds! Thanks for sharing with Retro Rubber!